Image: Larry Page is business person of the year. Photograph: Eduardo Munoz/Reuters. 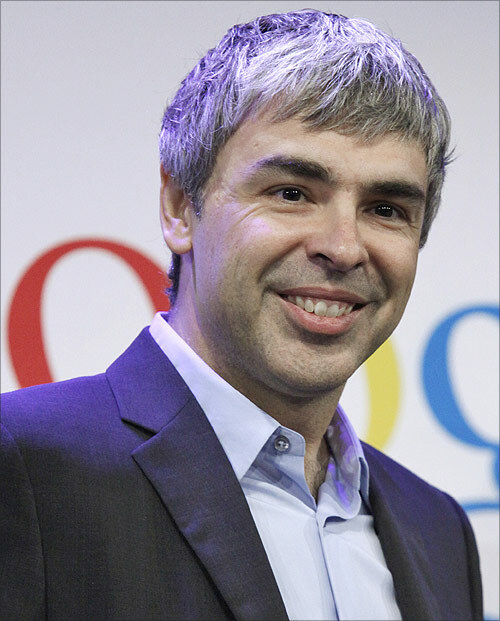 Google's Larry Page has emerged as the 'business person of the year' for 2014, edging past the likes of Alibaba co-founder Jack Ma and Facebook CEO Mark Zuckerberg, according to Fortune magazine. Page, who is Chief Executive Officer (CEO) and co-founder of Google, came on top in the 20 global corporate leaders' list compiled on the basis of various factors including company's performance, leadership style and total shareholder returns, the magazine said while bringing out its list. Apart from Jack Ma and Zuckerberg, others in the race included Apple's Tim Cook and fast food chain Chipotle co-CEOs -- Montgomery Moran and Steve Ells-- and Fedex chairman & CEO Fred Smith. Besides, five women have made the cut to the top 20 list. Interestingly, Amazon's Jeff Bezos, who led Fortune list in 2012, failed to make in to the top 20 list. As Google's core business continues to thrive, Page, who topped the list, is making "huge bets on new technology -ingestible nanoparticles, balloons that beam down broadband- that could define the future," the magazine noted. The list is based on various parameters like financial results of the company including 12-month and three year growth in profits and revenues, company's stock performance and total shareholder returns over the same periods.